Saudi ground forces deployed at the Yemen border, supported by the air force, have successfully repelled a massive attack by Houthi rebels on a border crossing, Riyadh has announced, saying that dozens of “hostile elements” were killed. In a statement issued by the Saudi Defense Ministry, Riyadh claims that the country’s ground forces “repelled an attack carried out by groups of Huthi militias and their supporters” in the border sector of Najran. The Houthis reportedly tried to capture border and control posts in Najran when Saudi forces engaged the attackers with “direct and indirect fire”. The Saudi Air Force also came to the rescue, targeting the rebels’ military hardware. “With the grace of God, our gallant forces managed to defeat the hostile evil elements,” the Saudi Press Agency wrote. At least three Saudi servicemen were killed, according to report, while taking out at least a dozen Houthi fighters. The Saudi side did not share the exact number of attackers, but the information released indicated that a large full blown attempt to attack Saudi positions. In a separate incident a border guard was killed by a shell, bringing the number of Saudi casualties in the five-week campaign to 14, Reuters reported. 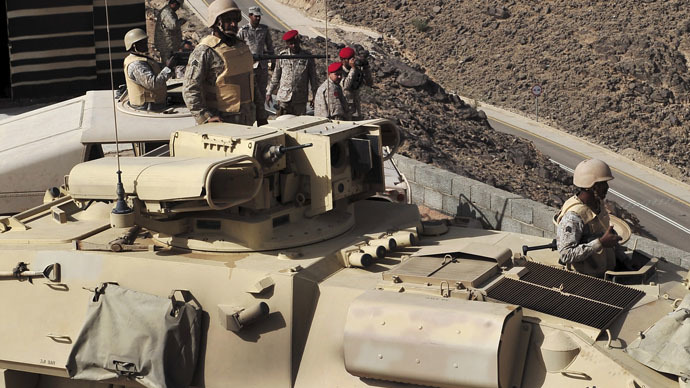 Since the beginning of the airstrike campaign in Yemen, the Saudis have managed to fortify their border with artillery, tanks and hilltop lookouts, and have stationed at least 15,000 troops in the desert and mountain border areas. In early April, Riyadh announced that some 500 rebels had died in sporadic border clashes with the Saudi forces. Although the first stage of the Saudi operation in Yemen, aimed at destroying first priority targets from the air, has recently ended, Riyadh continues to control Yemeni airspace. Earlier this week Saudi Arabia bombed the runway in the Yemeni capital Sanaa to stop an Iranian flight, reportedly packed with humanitarian goods, from landing there. The damaged caused to the runway has stopped the delivery of aid to the capital. Saudi actions that have hampered the delivery of vital aid to the country are a “very serious violation” of international standards, said Farhan Haq Deputy Spokesman for the UN Secretary-General according to TASS. He urged the Saudi-led coalition to let all aid into the country. At the same time United Nations World Food Programme (WFP) asked the warring parties to allow urgently needed fuel and food into the country. “This is a country where half the population are considered food-insecure, meaning that many families do not know where their next meal will come from,” said Purnima Kashyap, WFP representative.